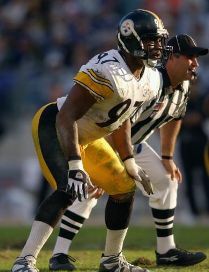 Bell was chosen by the Steelers in the second round of the 2001 NFL draft (39th overall) to compete for the inside linebacker position vacated by Levon Kirkland. While he was slow in picking up pass coverage skills, he showed from training camp that he was suited to the starting lineup with his explosive speed and pass rushing ability. He became the first rookie to start a season-opening game for the Steelers since Hall of Fame MLB Jack Lambert in 1974. Steelers went 13-3 to finish first in the AFC Central while leading the NFL in fewest overall yards allowed (4137) and rushing defense (1195 yards) and the AFC in fewest points allowed (212). Won AFC Divisional playoff over Baltimore Ravens (27-10). Lost AFC Championship to New England Patriots (24-17). Bell was nagged by an ankle injury in 2002 that caused him to miss four games and robbed him of some of his effectiveness. While he bounced back to play in every game in ’03, he was still far better against the run than in dropping back into pass coverage. However injuries, most notably a sports hernia that required surgery, limited Bell to just three games in 2004 and, released by the Steelers, he moved on to the Kansas City Chiefs. His three seasons in Kansas City were ultimately disappointing as he lost his starting job and continued to be nagged by injuries. Forced to retire in 2007, he ended up with 20.5 sacks in seven seasons – just 11.5 following his first year – and his Pro Bowl selection in 2001 was his only one. In all, he failed to fully live up to the outstanding potential he displayed during his Rookie of the Year season.